Set the proper atmosphere for your employees, clients, and guests. 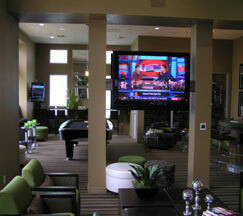 Imagine Audio Video will provide the right ambiance and help make the right impression. Whether you are setting the mood in your Urban Loft, High-rise Condominium, Restaurant or providing workspace background music, we have you covered. Bring the latest in technology to your Boardroom/Conference Rooms by partnering with Imagine Audio Video. Let Imagine Audio Video help you integrate the latest technologies into a simple and affordable solution.